Researchers studying the cause of a massive fish kill in the Peconic River in early summer of 2015 have concluded that “rising water temperatures and a spike in algae blooms fueled by increased levels of nitrogen caused low levels of dissolved oxygen in the river, which is ultimately believed to have caused mass asphyxiation” of hundreds of thousands of menhaden, a bait fish known locally as bunker. The fish kill, whose epicenter was in the Peconic River, left rotting, stinking bunker along the banks of much of the Peconic Estuary and cancelled Riverhead’s annual cardboard boat race in the Peconic River as a massive clean-up was undertaken to control the public health threat posed by the rotting fish. The study, conducted by the New York State Department of Environmental Conservation (DEC), the Suffolk County Department of Health Services (SCDHS) and researchers at Stony Brook and Cornell Universities outlines several contributing factors to three separate fish kills that occurred between mid-May and mid-June of last year. The study also found that a large population of predatory bluefish were blocking the mouth of the river, trapping the bunker in water that was rapidly being depleted of oxygen, and the algae had damaged the gills of the bunker, exposing them to a virus. While fishermen on the East End often recall years where the beaches have been strewn with the bodies of dead bunker chased ashore by feeding bluefish, bluefish appear to be just a contributing factor to last summer’s events, in which about 300,000 bunker are believed to have died. The full text of the study is online here. 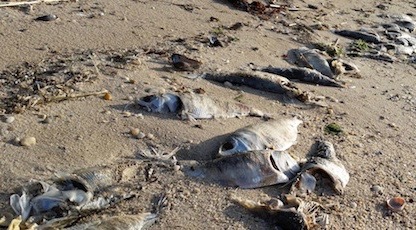 The fish kills occurred at three different locations along the two-mile tidal portion of the Peconic River between May and June of 2015, where the highest concentration of dead fish was reported near the mouth of the river off of Indian Island County Park and in the waters between the Route 105 Bridge and the Riverhead Yacht Club. The Peconic River has suffered numerous fish kills in the past — according to the DEC, between 1 and 3 million fish died in the river in September of 1999, 750,000 died in August of 2000, 100,000 died in May of 2008 and another 100,000 died in May of 2009. The timing and intensity of the algal blooms in 2015 was unique — the algae blooms last spring were more intense and the oxygen decline occurred much earlier than usual, in part due to high water temperatures. The DEC also cited an “unusually large biomass of adult menhaden confined in the river” as a contributing factor, along with the algae, in the extremely low dissolved oxygen levels that lead to the mass asphyxiation of the fish. While large numbers of fish confined to an area can consume a lot of oxygen, algae blooms also consume oxygen at night, and when they saturate the water, they reach a point where the entire bloom dies and begins to decay, consuming massive amounts of oxygen in the process. The county health department ruled out the possibility that illegal discharges, spills or the presence of toxic substances were contributing factors to the fish kill. Researchers from the School of Marine and Atmospheric Science (SoMAS) determined that harmful algal blooms were impacting the fish. The Stony Brook researchers found the harmful algae Gymnodinium instriatum was present in the river during all three fish kills and that two other harmful algae, Prorocentrum minimum and Karlodinium veneficum, were present in the river before the initial May 16 fish kill. All the partners involved in the study are continuing to monitor the river for repeat events this summer, and in the future. They’re encouraging residents to immediately report any observations of large fish kills to: DEC Marine Resources a to 631.444.0430, M-F 8:30 a.m. – 5:00 p.m. or via email at [email protected], or to the county health department’s office of ecology at 631.852.5750 or [email protected]suffolkcountyny.gov. While excess nitrogen in the water is an ongoing issue, and not one that researchers ruled to be the immediate or sole cause of the fish kill, excess nitrogen is one of the few anthropogenic causes of the chain of events that lead to the fish kill. It’s a cause that humans are responsible for, and a cause that humans can work to eliminate. Suffolk County Executive Steve Bellone, who has been on a mission for several years to reduce nitrogen outflow from septic systems throughout the county, pledged to do just that after hearing the results of the study.